1. Come for an individual tour. Individual tours are designed for prospective parents to learn more about Rockbridge Academy in a casual setting. Attendees will have the opportunity to hear directly from the admissions director and ask questions. We encourage visiting parents and students to observe a sampling of grammar, dialectic, and rhetoric classes. Meet our dedicated teachers and your child’s potential new classmates, and be sure to ask them why they love learning at Rockbridge Academy. Tours during regular school hours – starting anytime from 8:30 AM until 2 PM – are available by appointment throughout the school year and in the summer. Tours typically take at least an hour. To schedule a tour, please call 410-923-1171 or email Admissions Director Julie Marsh at jmarsh@rockbridge.org. 2. Stop by on Wednesdays! Walk-in Wednesday tours every week. Walk-in Wednesday tours are similar to an individual tour which give prospective parents the opportunity to see the school first-hand alongside the admissions director. Depending on turn out, visitors may be combined with other prospective families for a group tour. No advanced notice required! 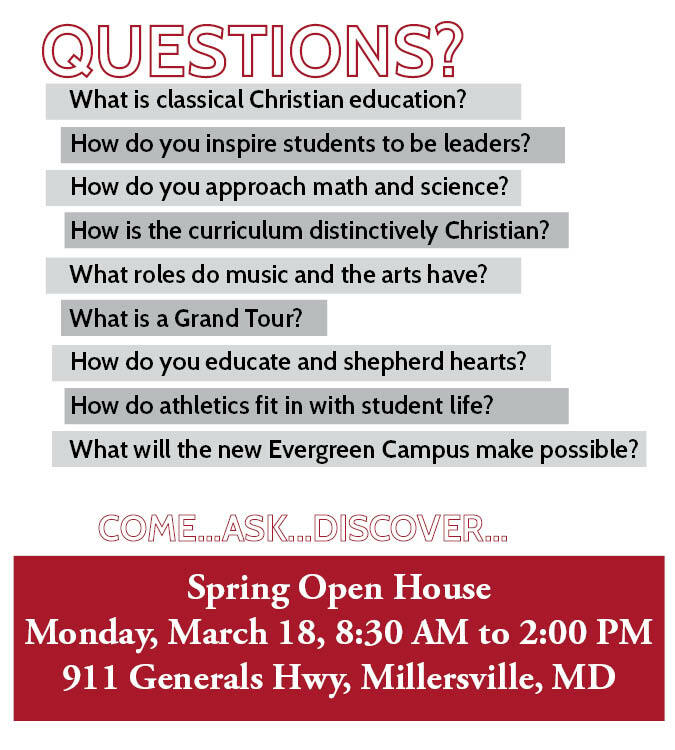 Drop by our Main Campus (911 Generals Highway in Millersville, MD) on any Wednesday at 9:00 AM for our Walk-in Wednesday tours. Tours begin at the Main Campus, and both campuses are visited. 3. Shadow for a day. Rockbridge Academy welcomes students who are currently in 4th grade or above to shadow with a current student to visit for part or all of a typical school day as you consider becoming part of the Rockbridge Academy community. Spending time in classes helps students and their families determine if the classical Christian curriculum is a good fit. As part of the application process for 5th grade and above, students write and submit a hand-written essay entitled, "Why I Want to Attend Rockbridge Academy." The shadow day will help to inform that essay. All families with students wishing to visit during regular class time are asked to contact Julie Marsh, our Admissions Director, at jmarsh@rockbridge.org. We strongly recommend that parents complete a tour or attend an open house event prior to their child's shadow day. Please know that some days will not be ideal for shadowing due to tests or special events, so please be prepared to provide a few date options. 4. Attend one of our Open Houses. Look for fall dates coming soon. If you missed our Open Houses this year, no worries! Schedule a tour or walk-in any Wednesday. Parents and students are welcome to come. Peruse our curriculum, learn about the Grand Tour, and ask questions about how classical Christian education really works. Come hear details about the transition to our new Evergreen Campus! 5. 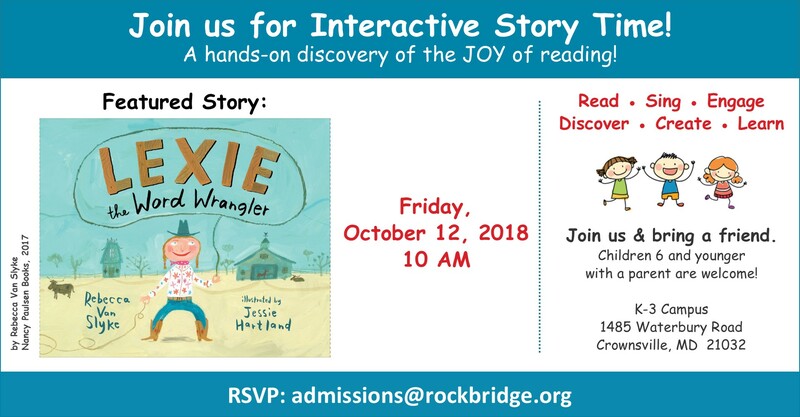 Join us for Interactive Story Time...coming this fall. 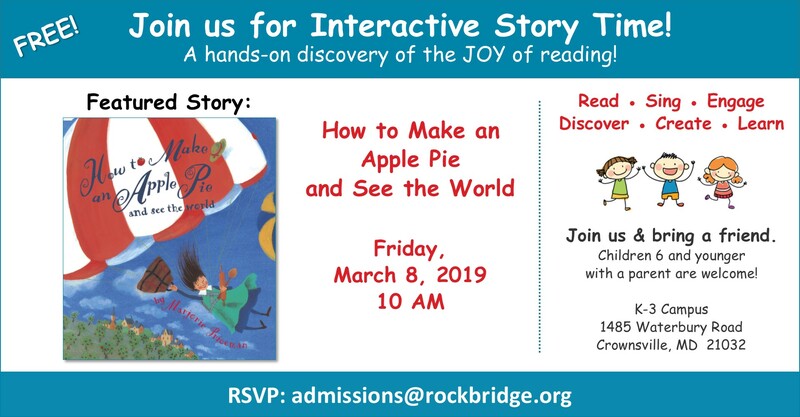 Story Time offers children 6 and under (with a parent) a chance to listen to a read-aloud story, sing songs, and bring the story to life with hands-on learning activities. Story Times for this school year are over, but we will continue in the fall. We had a wonderful time in 6 countries gathering supplies to make our applie pie! We made some new friends and got our passports stamped, and we even visited and held baby chicks, too! Stay tuned for future Story Times. 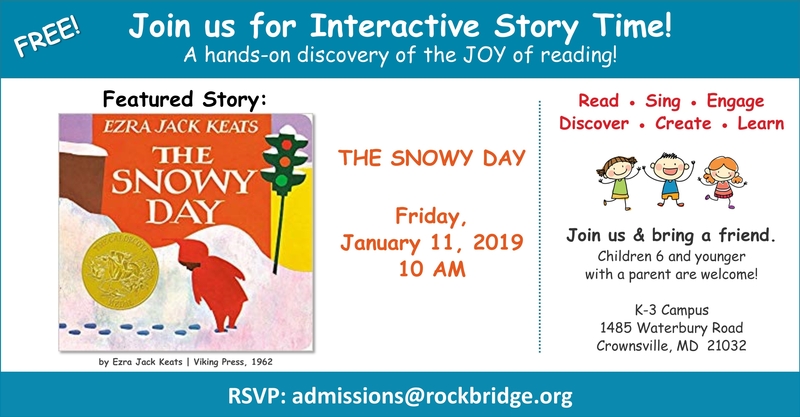 Come engage your little ones in the joy of reading! 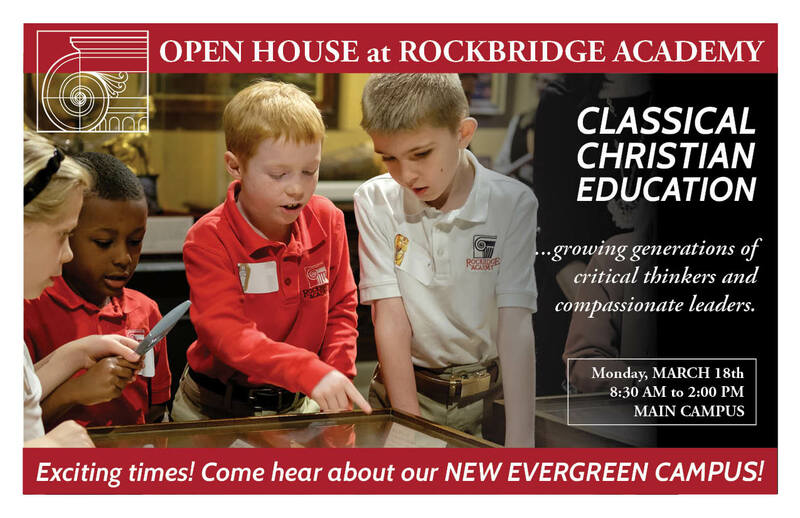 Rockbridge Academy offers multiple opportunities for prospective parents and students to learn more about our school. We welcome prospective students in grades 4 and higher to shadow a potential classmate to see a day in the life at Rockbridge Academy. Does the school desire what is best for my child? Does the school share my values and teach a Christian worldview? Does the school encourage parent involvement and respect parents' sovereignty over their family? Are students taught how to think? Will my child receive personalized attention?